Glenn Greenwald NSA leaks: U.K. tries to crack passwords on Guardian journalist's files. 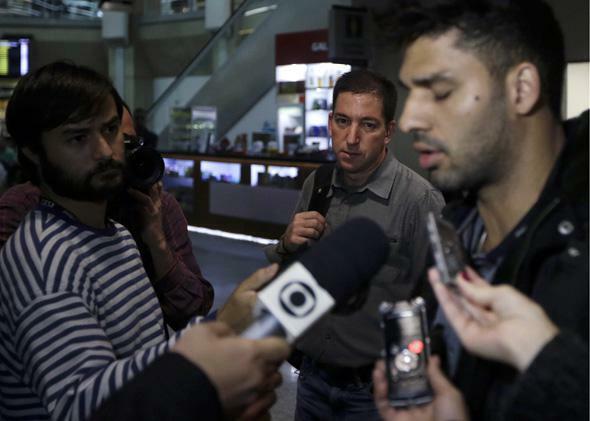 Guardian journalist Glenn Greenwald (center) looks on as his partner, David Miranda (right), talks with the media after arriving at Rio de Janeiro’s International Airport on Aug. 19, 2013. Earlier this month, British police seized a trove of leaked secret surveillance documents from the partner of Guardian journalist Glenn Greenwald at a London airport. Now, the country’s top spy agency has apparently been drafted in helping crack passwords Greenwald was using to protect the files. At a court hearing in London on Friday, senior U.K. government national security official Oliver Robbins said in a written statement that “misappropriated material” it had obtained from David Miranda included “approximately 58,000 highly classified UK intelligence documents.” Miranda was detained and interrogated for nine hours under terrorism laws on Aug. 18 while passing through a London airport en route from Germany to Brazil. He had been working as an aide to Greenwald, transporting materials between journalists who have been using a trove of secrets leaked by former National Security Agency contractor Edward Snowden to expose mass surveillance by the NSA and its U.K. counterpart, Government Communications Headquarters, or GCHQ. U.K. authorities have also drafted the National Technical Assistance Centre, a little-known section of GCHQ made up of cryptography experts and forensic computer specialists, to help them crack the encryption used to secure the files. According to the counterterrorism official, Greenwald’s drives were encrypted using software called TrueCrypt. The journalist has previously stated he was “not worried at all” that the authorities could break the encryption. But NTAC is a highly skilled outfit that has successfully helped police crack encrypted drives used by suspected child abusers to store indecent images. Whether the NTAC can get into Greenwald’s drives will depend on the exact configuration of encryption he used and the strength of the password on the files. TrueCrypt has previously proved too difficult for the FBI to crack, but NTAC will likely devote its full resources into gaining access to the documents, and it may be able to recover at least a portion of the files. U.K. authorities are also likely to share the seized files with the NSA, who have been boasting in recent years about “groundbreaking” new decryption capabilities. The U.K. is now considering prosecuting Miranda under the country’s Official Secrets Act and Terrorism Act for his role transporting the trove of files. Authorities say he was carrying material that could have endangered national security and U.K. intelligence officers’ safety, but Miranda was transporting the documents as an aide to journalists, and there is no evidence that he had any intention to indiscriminately publish the sensitive material online or hand it to al-Qaida terror chiefs for their perusal. The Guardian has been carefully redacting the files it has been publishing, even coming under fire from WikiLeaks for redacting too much. Either way, British authorities appear intent on pursuing a prosecution against Miranda under terrorism and secrecy laws—even if it means setting a precedent that undermines press freedom, putting any journalist working with classified information in the U.K. at risk of being accused of aiding terrorists.